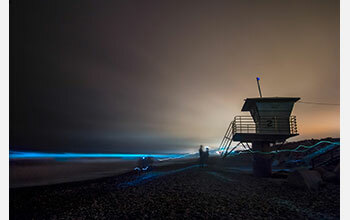 Bioluminescence from a red tide lights the waves blue in San Diego, California. 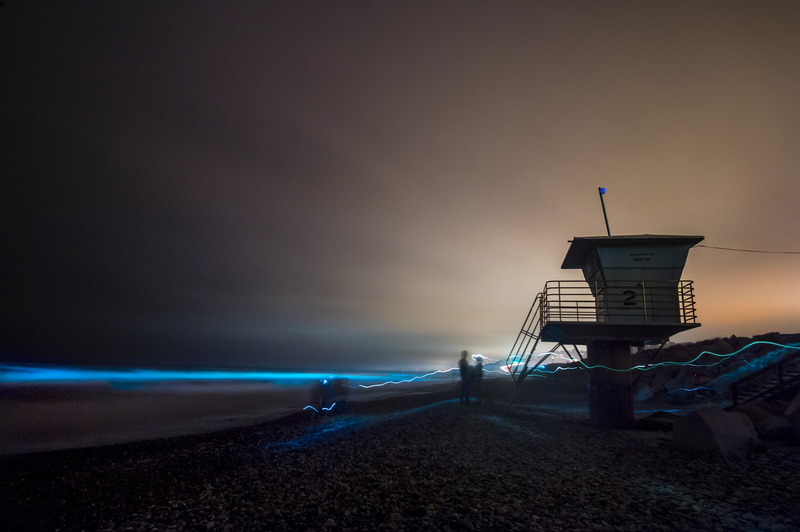 Bioluminescent red tides like the one that lit up the waves in San Diego, California, are due to a gathering of dinoflagellates, including Ceratium falcatiforme and Lingulodinium polyedra, the latter of which is well known for its bioluminescent displays. Dinoflagellates are single-celled organism with two flagella. Most are marine plankton, but they also are common in freshwater habitats. The waves or movement in the water causes the phytoplankton to glow neon blue at night, according to bioluminescence expert Michael Latz, a scientist at Scripps Institution of Oceanography at the University of California, San Diego (UC San Diego). Not all red tides produce bioluminescence. The red tide formed due to a combination of physical, chemical and biological factors that are thought to be important in allowing it to form. Researchers with the Southern California Coastal Ocean Observing System at Scripps perform weekly sampling to monitor for presence of harmful algal toxins and to learn more about the genetic and metabolic characteristics of the organisms. The coloration of the water is due to massive numbers of organisms, including the red tide L. polyedra. Each cell contains a little bit of sunscreen that gives it color. On sunny days the organisms swim toward the surface, where they concentrate resulting in the intensified coloration.